Feeling Bloated? Having problems being regular? Constipated? Pascoe Can Help! Legapas is traditionally used as a laxative and is made with the naturally sourced medicinal ingredient Cascara Sagrada. Legapas is suitable for adults and children aged 12 and older and should not be used for more than 7 consecutive days. A dose of 30-50 drops should be taken once a day in half a cup of hot water, either in the morning or evening, allowing for 6 to 12 hours for the laxative effect to occur. 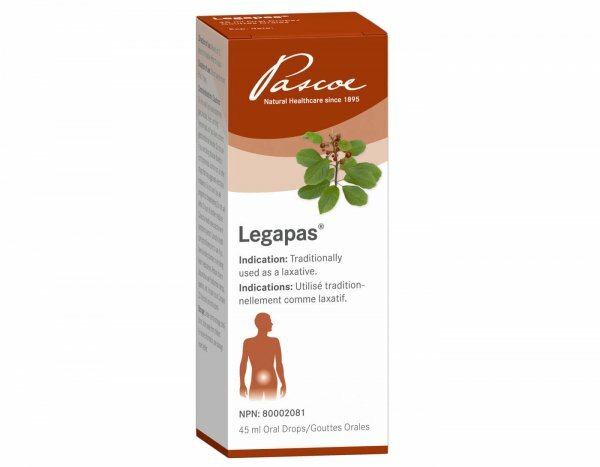 Legapas is available in 45 ml drops. It is important to understand the cause of being constipated and then to support the intestinal activity. Constipation is when your bowel movements are tough or infrequent. Infrequent is relative to every person, but generally going longer than 3 days without a bowel movement is too long. You can help prevent constipation by eating a well-balanced diet that includes plenty of fibre, drinking lots of water, avoiding caffeine, reducing milk and dairy intake and exercising regularly. Markofruct: A prebiotic to stimulate the growth of healthy bacteria in the gut and the growth of intestinal bifidobacteria. *Laxatives should only be taken for short periods. In the long term, it can adversely affect the body's mineral and liquid balance. * Do not use within 2 hours of another medication. Fluid extract (1:1.0-1.2) of 500 mg Cascara Sagrada – Frangula purshiana (DC. ), (bark, aged) standardized to 20 mg of hydroxyanthracene glycosides calculated as Cascaroside A. Adults and children (≥ 12 years): 0.9-1.5g (30-50 drops) once a day in half a cup of hot water in the mornings or evenings. Duration of use: Do not use for more than 7 days. Direction of use: Allow 6 to 12 hours for laxative effect to occur. The maximum daily dose must not exceed 50 drops. The appropriate dose for a given patient is the lowest dose needed for soft, formed stools. Do not use with abdominal pain, nausea, fever, vomiting, hemorrhoids. Do not use if taking thiazide diuretics, corticosteroids, licorice root, or other drugs that may aggravate electrolyte imbalance. Do not use in pregnancy or breastfeeding. Do not use within 2 hours of another medicine. Use caution in a patient with a kidney disorder or who are taking heart medications. Reduce dose or discontinue use if abdominal cramps, spasms, and/or pain occur. Very rarely cramp-like gastrointestinal symptoms; in these cases, the dose will have to be reduced. Harmless discolouration of your urine may occur. Prolonged use or use of higher doses (abuse) may cause disturbances of the water and electrolyte balance. Diarrhea may lead to potassium loss in particular. Potassium loss, in turn, may give rise to disorders of heart function and muscle weakness, especially if cardiac glycosides (drugs that strengthen the heart muscle), diuretics (drugs that increase urinary output), and/or cortisone and cortisone-like drugs (adrenal cortical steroids) are being taken concomitantly. Prolonged use may lead to excretion of protein and blood in the urine. Patients may also experience discolouration of the intestinal mucosa (pseudomelanosis coli), which usually resolves upon discontinuation of the product. Chronic use or abuse may lead to potassium deficiency and thus increase the effects of certain drugs that strengthen the heart muscle (cardiac glycosides) and interfere with the effects of drugs for heart rhythm disturbances (antiarrhythmics). Potassium loss may be increased by the concomitant use of certain drugs that increase urinary output (diuretics), cortisone and cortisone-like drugs (corticosteroids) or licorice root. This stuff works as it's supposed to - as advertised! !